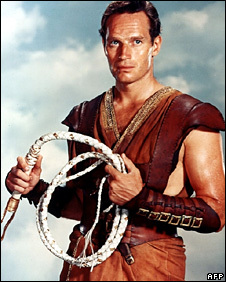 Whether starring as Judah Ben-Hur, Michelangelo or Moses, Charlton Heston personified the larger-than-life heroes of the Hollywood epic. 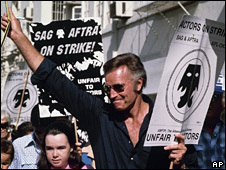 Charlton Heston's life story reads like a film script. From the backwoods of Michigan, he became one of the world's most famous faces, a high-profile campaigner for Civil Rights and an unapologetic president of America's National Rifle Association. He was born John Charles Carter in Evanston, Illinois. By his own admission "shy, skinny, short and pimply", he studied acting before serving for three years in the US Air Force. Back in civilian life, Heston and his wife, Lydia, went through hard times, while waiting for his first break as an actor. Living in a single room in Chicago, at one time they posed for artists, at $1.25 an hour, before Heston finally attracted Hollywood's attention. In 1952, after working on Broadway, Heston starred as the ringmaster in the movie, The Greatest Show on Earth. Four years later, he appeared as Moses in The Ten Commandments, the role which would define his career. Physically imposing at six foot four, with granite-hewn features and a deep, sonorous voice, he radiated screen presence. No role was too big for Heston. In The Greatest Story Ever Told, he was John the Baptist; he played El Cid, along with Michelangelo in The Agony and the Ecstasy and General Gordon in Khartoum. And, in 1959, he won an Oscar for Best Actor for his performance in Ben-Hur. On stage, he was Sir Thomas More in A Man for all Seasons, Macbeth and Antony in Antony and Cleopatra. 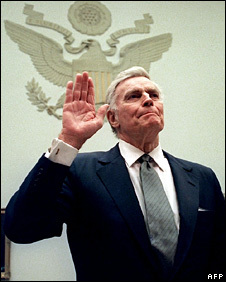 Although later identified with traditionally conservative causes, Charlton Heston was a vocal supporter of Martin Luther King and the 1960s Civil Rights movement. After King's assassination, and the murder of Robert Kennedy, Heston called for gun controls. He later said that he was "misguided". The science fiction film, Planet of the Apes, proved a big commercial success in the late 1960s, and Heston almost became a fixture in 1970s disaster movies like Earthquake and Skyjacked. And his big-screen performance in the environmentally-tinged sci-fi thriller, Soylent Green, brought him cult status among a younger audience. The 1980s saw a rare foray onto television, as Jason Colby in The Colbys. But, later in his career, Heston turned increasingly back to the stage, and to fighting for his political beliefs. During his six years as president of the Screen Actors Guild , he decried the trend for undermining traditional American heroes. And, having grown up in the Michigan woods where poor people sometimes shot their next meal, Heston became embroiled in a passionate national debate over gun laws. A high-profile president of the National Rifle Association, he once vowed that the only way the government would take away his gun was from his "cold, dead hands". On 9 August 2002, he issued a statement, announcing that his doctors had diagnosed "a neurological disorder whose symptoms are consistent with Alzheimer's disease". A self-avowed Anglophile, he was a hugely enthusiastic reader of the Aubrey/Maturin novels of the late Patrick O'Brian and was co-chairman of the American Air Museum in Britain. Heston once said of himself, "I have played three presidents, three saints and two geniuses in my career. If that doesn't create an ego problem, nothing does." 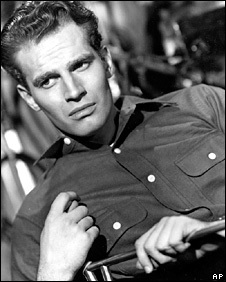 But, while his screen giants gave him the stature to champion his causes, Charlton Heston, along with many critics, felt his best film performance was as the shy, awkward ranch hand in Will Penny. And while Charlton Heston will always be identified with heroes who lived before the birth of his country, it was perhaps the American pioneer who was closest to his heart.